DiRuggiero Earthscaping LLC has merged with Bruno's Landscaping, Inc! We are extremely excited about combining our resources and experience to bring better service to you! Welcome to Bruno’s Landscaping. We have been serving the Northeast Ohio area for over 25 years. 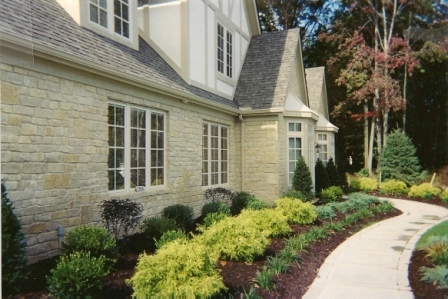 We specialize in high quality, residential and commercial landscaping design and construction. Whether you want a patio, retaining wall, walkway or planting beds, we take pride in attention to detail to deliver a quality product. This motto tells our story. It takes a special talent to visualize customer needs and ideas. We have the expertise and skills to bring to life your ideas. Bruno’s Landscaping delivers the highest quality in craftsmanship and is second to none in customer service and satisfaction. Bruno's Landscaping qualified for the 2011, 2012 and 2014 Angie's List Super Service Award - an extremely exclusive honor! Approximately 5% of businesses on the List qualify for this huge accomplishment. Bruno's Landscaping is also proud to announce our A+ rating as a Better Business Bureau (BBB). Accredited Business. Thanks so much to you and your crew for the beautiful job on the steps, patio, and mulch. We certainly will enjoy our fabulous yard thanks to you! We truly thank you for the beautiful job you and Rich did on our patio. It is a very impressive improvement to our property. When people come and see the patio they ask if they can bring their friends to see the patio. What a wonderful compliment to both of you. Also wanted to thank you for the great landscaping job. You turned our little yard into a place of beauty. I would be remiss if I did not tell you what a pleasure it is to see those clean-cut, hard working young men that work for you. How refreshing in this day and age.